UPDATE: Steve Jackson Games has extended the deadline to December 9! SO WHO’S EVER DREAMED OF BEING LIKE ME? OK, let’s phrase that differently: who’s ever wanted to design your own Munchkin T-shirt? And who’s ever wanted to win $1,000 at the same time? So here’s where I tell you about the WeLoveFine/Steve Jackson Games MUNCHKIN DESIGN CONTEST, and become your best friend for life! 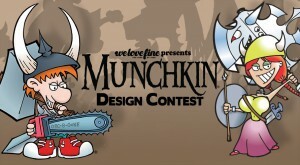 Here’s the deal: WeLoveFine has been producing some cool Munchkin T-shirts for Steve Jackson Games, and now they want you to come up with some ideas, as well! You know – share in the fun. 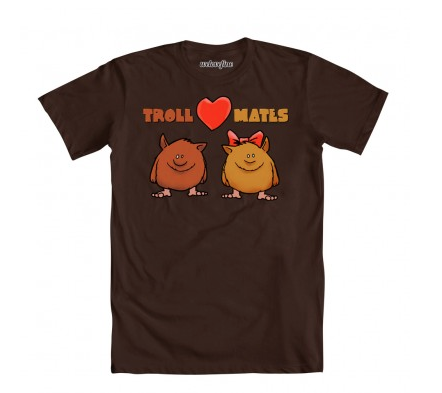 Look, I’ve designed cool Munchkin T-shirts, and I have fun on a daily basis! DAILY! Plus, there are a ridiculous number of prizes! I mean, I’m no math major, but by my count, there are 14 prizes that START at $150, and finish at at least $700…and possibly topping off at $1,000! No but really this contest is so hot, I believe I used up my exclamation mark quota for the month in the preceding paragraph. Grand Prize (1): Grand Prize Winner will win up to One Thousand Dollars ($1,000.00) Cash. Prize starts at $700.00, after the ratings hit 100,000, every 100 ratings will increase the prize pool by $1.00. Max prize will be $1,000.00. The Grand Prize winner will also receive three (3) Munchkin Games of their choice, 1 of which is signed by Steve Jackson, and 1 of which is signed by Andrew Hackard! GeekDad’s Pick will receive three (3) Munchkin Games of their choice, 1 of which is signed by GeekDad! Guest Judges’ picks (3): Three (3) Our guest judges will each select their personal favorite design, and those artists will win $400 cash! Steve Jackson Games’ Pick will receive three (3) Munchkin Games of their choice, 1 of which is signed by Steve Jackson. Andrew Hackard’s Pick will receive three (3) Munchkin Games of their choice, 1 of which is signed by Andrew Hackard. GeekDad.com’s Pick will receive three (3) Munchkin Games of their choice, 1 of which is signed by GeekDad! Think Geek’s pick (1): Think Geek’s pick will receive $250.00 cash, and will be available exclusively on ThinkGeek.com! Hot Topic’s Pick (1): Hot Topic’s pick will receive $250.00 Cash and will be available exclusively at Hot Topic! Runners Up (2): Two (2) Runners up will each win $150.00 Cash! If I was a sports talk radio host I’d probably say something like “That’s a lot of ducets,” or the like, then I’d complain about Dallas’ defense. But I’m not. I’m a cartoonist, and all I have to say is that designing T-shirts is fun and easy, and IT’S A THOUSAND DOLLARS! Give it a go! The deadline is November 11, and it’s coming up soon! Don’t worry about the graphics: I never do. Just send in some good ideas, and get ready to stab your buddies in the back… AGAIN I SAY THIS: Steve Jackson Games has extended the deadline to December 9! …while wearing the stylish Munchkin T-shirt that YOU designed!